Salmon fillets in basil sauce with butter rice. Birthdays are always a big celebration around our house. Yesterday we celebrated our son turning 9. Years ago we have started the tradition to have a small birthday cake for breakfast. With homemade signs wishing him a happy birthday placed all over the house, small chocolate strawberries cake and candles lit, we gently walked into his room singing “Happy Birthday” to him. His surprise and happiness shined thru and it warmed our hearts. His beautiful smile ear to ear has not left his face since. He did not want to go out to dinner to his favorite restaurant last night, instead he wanted to spend the evening at home with mom’s homemade cooking. Truth to be known, he received a wonderful gift for his birthday therefore he knew he could not take it with him. Since he could made the decision to where and what to have for dinner…. you all see where I am going with this. Last night dinner was from one of my all time favorite chefs and writer, Jacques Pepin. His latest book: Essential Pepin, is a great present to everyone that enjoys cooking. I followed his recipe and just modified it by adding more tomatoes and the butter rice to it. A simply delicious and fast dinner. Preheat the broiler. Brush the fillets on both sides with the olive oil. Sprinkle with ¼ teaspoon of the salt. Arrange on a cookie sheet. Melt the butter in a large skillet. When it is hot, add the tomatoes and sauté over medium high heat for about 1 minute to warm them. Add the remaining ¼ teaspoon salt, the pepper and the basil and set aside. Meanwhile place the fillets under the broiler, about 2 inches from the heat source and cook for 2 minutes. Do not turn the salmon. Arrange a nice scoop of rice in the middle of a plate. Spoon some of the tomatoes sauce over it. Place the salmon fillet over the rice-sauce. 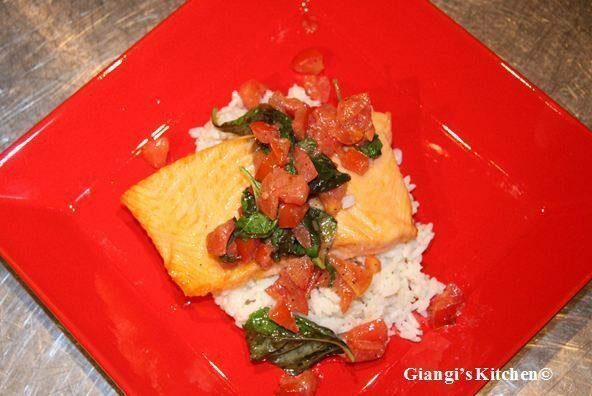 Spoon more tomato sauce over the salmon and serve immediately.